At our house home decor gets put through the paces, none more so than rugs. Our floor coverings have had to weather aging animals, muddy boots and all sorts of other stuff too yucky to mention here. Rugs are the Rodney Dangerfields of decor around these parts – they get no respect from the menfolk that wanders through the house. We have put just about every kind of material through the paces and quite a few just didn’t hold up. Size, material, style, shape, design, $$$… But I bet you already know, finding just the right area rug for your space can be a real challenge! What works well for some may completely bomb at your house. Have you looked online lately? I have shopped for rugs until I was dizzy from trying to decide which one to go with next. You can easily spend hours evaluating all the different options. We have come a long way since my newlywed days when most rugs were boring, predictable and came from a department store. While there is no one rug type that fits all situations, there are ways to insure your next area rug purchase won’t leave you needing a vacation. That is why I am here today to help you figure out how to get the best rug for your room without pulling out your hair in the process! Getting a good grip on what you are actually looking for, what will work best in your space, before you ever get online or visit the home decor store is the most important step before you ever start shopping. Doing a little homework up front will save you from buyers remorse down the road and hopefully save time and money to boot. Actually, it’s not that complicated, provided you follow a few simple steps. So let’s explore which considerations play into making the right decision when it comes to purchasing your next area rug! To make your decision even easier, I put down a useful guide with common measurements as well as visual guides to keep handy any time you find yourself in need of a new area rug. You can find the entire guide in the Resource Library completely FREE! Just sign up here and the password is on its way to your inbox. This post contains affilate links. That means if you make a purchase through one of these links, I may earn a small comission to keep the lights on here on the blog at absolutely NO extra cost to you. You can read all of the boring legal stuff here. Before I go on here, it should be pretty obvious by now that we are not discussing pricey investment rugs today. That is a whole different subject. While the principles listed below certainly apply to any kind of area rug, this post was written with affordable, readily available options in mind. Even though this seems like a no-brainer, a lot of people get this one wrong. A puny looking rug that barely fits under your coffee table is just as ridiculous as one that overpowers your room so much, all you can see is the rug. It’s no different than an ill fitting dress. Getting this one right is important to the look and feel of your finished space. Finding the right balance here is something you will not regret! So, how do you get the proper measurements, you ask? Thankfully there are guides that are easy to follow and take the guess work out of insuring you don’t buy the wrong size. Generally, leaving at least an 18″ border to any adjacent wall around the rug is a good rule of thumb. Are you trying to accentuate and anchor a space? You may get away with placing a rug in the living room in front of your furniture. A generally accepted rule is for your sofa and chairs to either all be on the rug or completely off. Dining rooms generally call for leaving ample space around the table and chairs, to make it easy to move chairs in and out and to prevent tripping when moving around the table. Are you merely adding a little color to a bedroom or trying to create a soft cushy landing spot all around the bed? 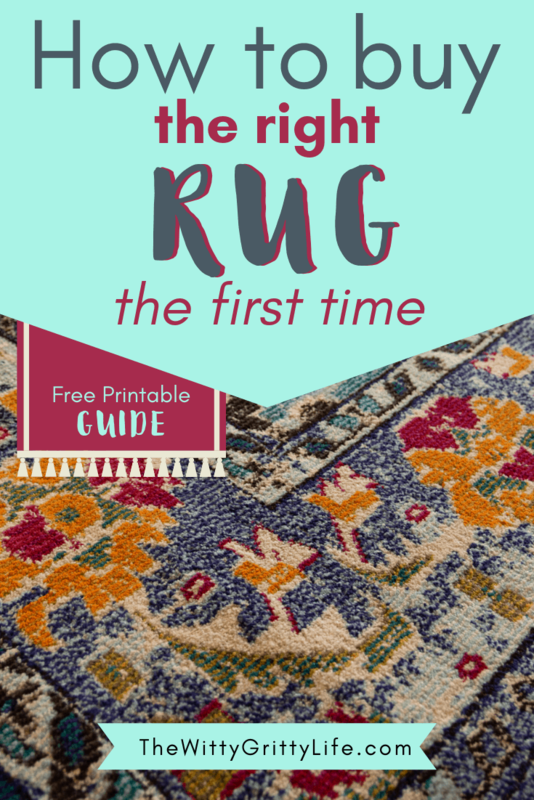 Check out my useful guide in the FREE Resource Library, written specifically for you my awesome reader, to help you decide just how large or small your next rug should be. Clearly how your space is used plays a big role in the final buying decision. Are you purchasing your rug for a high traffic area such as a mud room, hallway, foyer or living room? Do you just want something cushy underfoot? Is the area rug anchoring space in your home office? Are you defining your amazing personal style and not worried about wear and tear? Determining usage is important when figuring out what type of material will work best (more on that in the next category), thickness and type of weave. Clearly, the lovely wool shag rug that works so well in the bedroom, would be nothing but annoying under the wheels of an office chair. And who wants to vacuum crumbs out of a long pile area rug under a dining room table? You should be able to easily move through and clean your space. Choosing the proper rug for how the room is used is pretty important! 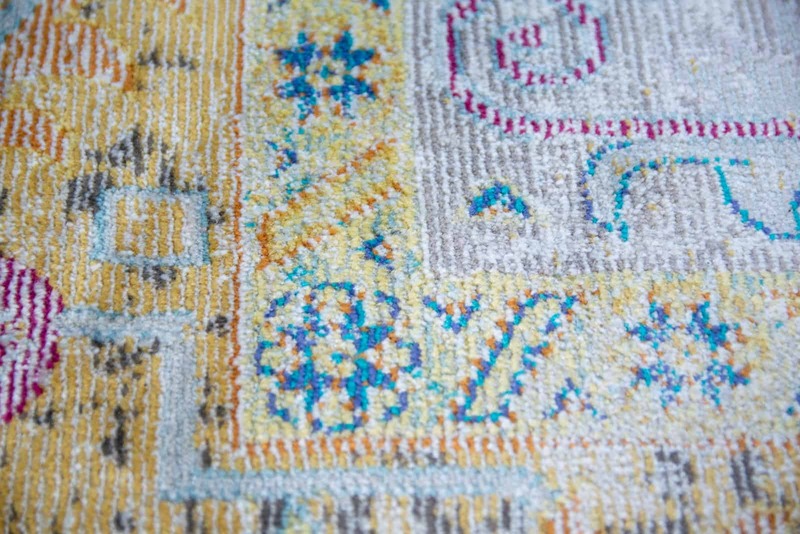 It will save your the grief of watching a favorite rug die an ugly, premature death and make your life easier to boot. Other factors that come into play when considering use are whether or not your new area rug will be exposed to direct sunlight or high humidity. Both can have a major impact on the materials you want to consider. More on that below. That brings us to choosing the right material for your rug. Do you vacuum daily? Will your area rug experience high traffic? Do you have pets that shed a lot and drag in mud and dirt from outside? Are you concerned about tripping hazards? Finding the right material to suit your needs will save you lots of headaches and keep you safer to boot! Rug materials can be divided into two major groups: natural and synthetic. Each material has distinct benefits and disadvantages. Which type you choose depends largely on your own personal preferences and the specific types of use as well as where it will be placed within your home. Natural materials are often more sustainable but the raw material may have been treated with pesticides. Look for chemical free or organic versions. Wool has a number of benefits that make it well suited to a variety of different uses. As a natural material, wool is actually fairly stain resistant. Dirt tends to stay on top and can be vacuumed off. It is a more sustainable and energy efficient material than some of the synthetic options. Since it absorbs dye easily, it comes in a variety of gorgeous colors. If you have ever owned a nice quality wool rug, you know, the feeling of luxurious wool underfoot can’t be beat. Having said that, there are some considerations that don’t make wool a perfect fit for all spaces. This applies especially to areas like dining rooms where spills are more common. Wool also has a tendency to absorb moisture and is not well suited to an environment that frequently experiences high humidity like a house in the South without airconditioning. If you plan on placing your new area rug in a room that receives high traffic and will be vacuumed frequently, wool may not be the best choice as it sheds quite a bit. This leads to much faster wear and tear, as you literally lose part of your rug with each vacuuming. Cotton is generally used in flat weave style rugs and works best in areas that receive low traffic. While it is washable, it also absorbs stains easily and have a tendency to turn brown over time. Cotton rugs are a good choice for areas like bedrooms, but also bathrooms where they will be swapped out more frequently. Organic versions are becoming much easier to find. Cotton rugs, especially flat weaves are more challenging to vacuum and have a tendency to bunch up. Silk with its delicate look and luxurious feel is surprisingly durable. It also one of the most expensive options, especially the handwoven variety. Silk rugs originated in Asia and have been prized for their exceptional beauty and traded for thousands of years. Their delicate feel is deceptive as silk fiber is amazingly strong and durable. It readily accepts brilliant colors, but is also prone to fading in sunlight. Silk doesn’t stand up to chemicals including wine, alkaloids and bleach. It requires professional cleaning by someone specializing in the care of oriental rugs. Silk is best used in very low traffic areas that don’t receive direct sunlight. While jute and sisal are often used interchangably, there are distinct differences between these materials. Sisal is a fiber that is won from an agave plant. It stands up well to wear and tear and is suited for high traffic area, but should be avoided on stairs, because it becomes slick with age. It but can be a little tricky to clean, so it is important to vacuum sisal frequently and clean up spills immediately. Sisal is a material on which very few pesticides or fertilizers are used. Jute is a softer vegetable fiber that is generally used to produce coarse cloth, curtain fabrics and even finds use as a backing for linoleum tiles as well as wool rugs. Not quite as durable as sisal, it is softer and can be found in a greater variety of style and colors. Jute works very well in areas like bedrooms and family rooms, where you might walk on it with bare feet. Olefin or polypropylene mimics the look of wool closely and is found in use for both indoor and outdoor rooms. It does not fade and is not sensitive to water. It does, however, attract oils, which can be near impossible to remove. Polypropylene is therefore used to help clean up oil spills. As a durable material it holds up well to medium traffic and sheds very little. Can you believe this is polypropylene? This is the rug in our master bedroom and it feels just like silk! Nylon comes in two forms as far as rugs are concerned. Until recently nylon 6,6 was preferred over nylon 6 because of better colorfastness and resistance to static. New advances have narrowed the differences enough to essentially make them equals. Nylon is a petroleum product that was the first truly synthetic fiber used in rugs. Nylon area rugs stand up to heavy foot traffic, but have a tendency to flatten out. It can be revived with steam to bring the fibers back up to their original height and will hold up for years with proper care. The majority of nylon rugs are chemically treated to be stain resistant. Polyester is softer than nylon, but less durable, which is reflected in its lower price tag. It also tends to shed quite a bit and the fibers may get on hands and gets on fur. Nonetheless the soft material combined with it’s ease of cleaning makes polyester a good fit for homes with pets. Vacuum frequently! Also notable is the fact that some polyester rugs are actually made from recycled plastic bottles. Triexta is a relatively new kid on the block as far as rug material is concerned. Rather than petroleum, triexta is maunfactured with corn glucose, a material that is quickly and readily replenished. Not quite as durable as nylon, triexta makes up for its “short comings” by the fact that it can be cleaned with water. So if you are looking for a synthetic material that is low in VOC’s, ecofriendly, budget conscious and stain resistant to boot, you might want to give triexta a look. I won’t disect everyone of these, because they are fairly self explanatory and dependent on personal taste. Flat woven, braided and hooked rugs can work well in areas like hallways and bathrooms, provided they are properly secured to keep them from sliding. As stated above, a shag rug is not well suited for use in a dining room with its spills and crumbs or an office with rolling chairs. Keep them out of high traffic areas where they might present a tripping hazard of be in need of constant cleaning. Otherwise, use your discretion, taking into consideration the specific pros and cons of each of the above listed materials. Ask yourself whether you are trying to make a bold design statement or you are complimenting the furnishings in the room. Obviously, this is a highly personal choice based on your specific taste. Are you just trying to add a little color? A subtle pattern in a solid color might be your best option. Bright and loud patterns may look amazing for a short while, but most of us tend to get tired of most bold looks after a short while. Be sure to take that in to consideration especially if you are shopping for the longrun. Obviously, stains have a tendency to show much easier on lighter and/or solid colors, so keep that in mind if frequent stains are an issue. How much of your rug will actually be visible? How well will it work with the pieces and the wall color that are already in the room? Are you someone who enjoys swapping out accent pieces regularly – opt for something more neutral that will work with a variety of different styles. Now that you found your next new rug, don’t skimp on a couple of little extras like rug pads and rug grippers. Rug pads add additional cushiness while insuring that your beautiful new rug stays in place securely. This prevents wrinkles that can add to additional wear and tear over time, not to mention present a tripping hazard. Rug grippers insure your rug corners don’t stick up, something that is not only unsightly but unsafe as well. If you do find early wear and tear, you may opt to move the rug to a different area with less traffic to extend its life. Purchasing on the internet? Be sure to look at all the pictures and read reviews closely. You can get a good sense of how true the colors are, and if the product lives up to its promises. It’s the closest thing to being able to see the area rug up close and dig your fingers into its pile! 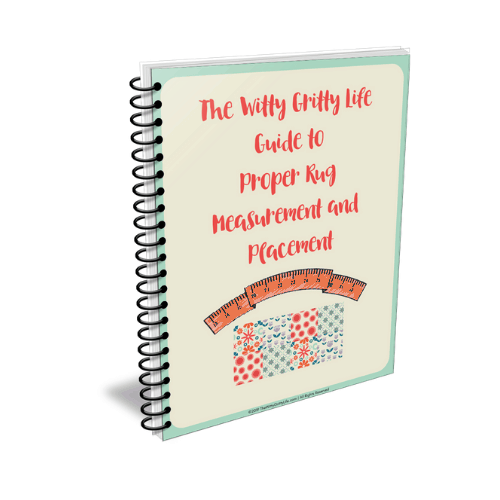 For my helpful FREE printable guide to assist you with measuring, sizing and rug placement, don’t forget to sign up for the Resource Library. It’s filled with lots of tips, recipes and printable art and extras not available on the blog! To keep up with the latest, join our Facebook group or follow me on Instagram to see what kind of trouble I am getting into that day! I hope you find this information helpful when it’s time to purchase your next area rug. As the mother of boys and pet Mama deciding on the right rug for our needs has been a hit and miss. Through the years I have gained a whole lot of experience in this area. You may be curious what types of rugs grace our floors. While I was in love with our almost shag like, boldy patterned wool rug, it has not held up well to the daily vacuuming it received. Therefore we recently moved it to our guest bedroom and replaced it with the bold pattern rug seen in the cover image. Most of our rugs are currently made from polyplropylene. I have had a lot of good experiences with their feel, look and durability as well as ease of cleaning. Be sure to share your experiences in the comments below! I would love to hear your take on it!